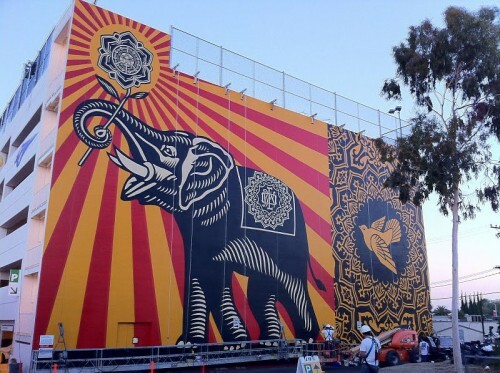 Here is the Peace Elephant mural I just painted with the help of my crew on the library in West Hollywood. We finished Saturday after 6 days working between 12 and 16 hours. It is 70 feet by 106 feet. It is the largest mural I’ve ever done wheat-pasted or painted. It was quite an undertaking and I have to thank my assistants Nic Bowers, Dan Flores, Jason Filipow, Kyle Oldoerp, and the several interns who worked very hard on the project. Thanks to MOCA and the City of West Hollywood for facilitating. Calm down taxpayers… I was not paid to do the mural and paid for my own supplies and labor. Thanks for the wall space though. 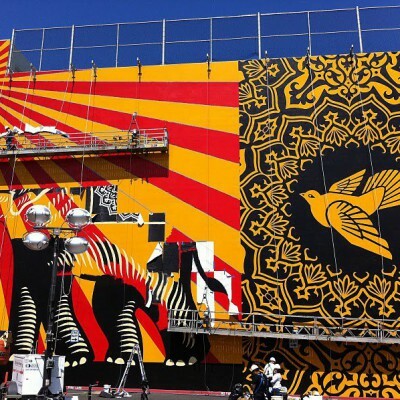 By the way, Retna and Kenny Scharf did great murals there too. Go check them out at Melrose and Robertson if you are in LA.